What If You Could Slow the Hands of Time? Perhaps the most crucial moment in my strange long journey to beat cancer, was the moment I walked into the high mountain village of Shimla in northern India, over 30 years ago now. The venerable old professor at the Hahneman College in Bombay (now called Mumbai) had pressed a letter into my hand that would introduce me to a little-known healing center and place of Hindu religion that he felt would benefit me in my fight. When you’re fighting cancer, if someone suggests dancing with dolphins, you do it, since as we all know life can turn on a dime. So off I trudged by rickety train and bumpy bus for eight days and nights to Shimla, where part of me still resides, high up in the Himalayas and as close to God as you can get I think, in a physical sense. Maybe it was the altitude, but my head was spinning and struggling to cope with the amazing surroundings. The address on the notepaper got me to a pale blue temple up a side street with a yellow painting of a diety on the outside. The diety I learned was Lord Vishnu, the Preserver or Sustainer of Life in Hindu religion, the Supreme Lord. For thousands of years, he has been revered and prayed to as the source of all Peace and Truth. No wonder I was sent there! I met the Holy Basil my first day at the temple, but I didn't know it. In the days, weeks and then months that I lived there, every split second helped me heal and in every possible way; mentally, spiritually and also physically. I consumed mysterious herbs, teas and tinctures that are an integral part of Lord Vishnu’s philosophy. It was like I entered a very special Healing Zone where other-worldly powers took over and enveloped me. What the disciples taught me so well was the power of adaptogenics in coping with the maelstrom of life around us. And how to arrive at a state of calm in the midst of a storm, whether mentally, spiritually or physically. (in herbal medicine) a natural substance considered to help the body adapt to stress and to exert a normalizing effect upon bodily processes. This was done through what we ate, what we thought and what we prayed. It was done through meditation, to arrive at place and a state of calm and reflection that washed away the stress and the noise and clamor of daily life. Everyday at the temple we consumed countless cups and bowls of special teas and soups and curries that contained the supreme herbs in all of Ayurvedic medicine, practiced in India and Asia since time immemorial. And then it hit me. I kept waiting and wondering when I was going to meet this amazing doctor, the Holy Basil, that would help me in the final step of my healing and recovery. It turns out the old professor wanted me to meet a plant! The sanskrit word for Holy Basil is Rasayana, meaning juice or elixir. Rasayanas are herbs used to rejuvenate or change degenerative processes that lead to disease. 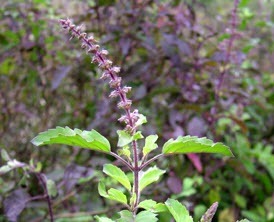 Native to India, Holy Basil is also known as Tulsi or The Incomparable One. Revered in India for over five thousand years and a sacred symbol in Hindu religious tradition, a Hindu household is considered incomplete if it doesn’t have a Tulsi plant in the courtyard. Apart from its religious significance Tulsi is renowned for its restorative powers, as it is a rich antioxidant and one of the most effective adaptogens known. I didn't realize it at the time, but the teas and soups the disciples were feeding me were loaded with Tulsi, restoring my adaptogenic abilities at the cellular level, while teaching me methods to "adapt" and manage stress externally. This is the highest level of medicine in both India and China and indeed in all of the East. It means that it literally re-programs the body and the mind (and spirit) to “adapt” to the situation around it and remain in control, in full power of all abilities. In fighting something like cancer, this is an extraordinary adjunct to any treatment and totally unknown to modern day oncologists, who can only grapple with clumsy chemotherapy drugs and radiation. It is health in another dimension. "Modern scientific research offers impressive evidence that Tulsi reduces stress, enhances stamina, relieves inflammation, lowers cholesterol, eliminates toxins, protects against radiation, prevents gastric ulcers, lowers fevers, improves digestion and provides a rich supply of antioxidants and other nutrients. Tulsi is especially effective in supporting the heart, blood vessels, liver and lungs and also regulates blood pressure and blood sugar." Studies have also shown that Tulsi has Cox-2 Inhibitor qualities, acting like a herbal Celebrex to dramatically reduce cellular inflammation, which in turn leads to a reduction in everyday aches and pains, normalizing your blood glucose, and imparting a highly positive benefit to your mental outlook. What if you could Age "Less"? It has been my dream since way back then to have a special high-healing formula that would use the amazing herbs from the Ayurvedic medicine kingdom, without having to ride a bone-rattling bus or creaking old train for days to get to Shimla. It brings me much joy and pride to sit and talk to you about these amazing adaptogenic marvels and also to be able to bring them to you over the years. There are thousands and thousands of nutritional formulas available today, and barely a day goes by without some amazing new discovery or another. This is not one of those, no - far from it. Can you guess what the #1 ingredient is? It is Holy Basil of course. But we didn't stop there. We gathered together a host of powerful adaptogenic herbs and anti-aging compounds to promote a healthy inflammatory response in the body. Take as needed to help to calm emotions, recover from exercise and also relieve pain and inflammation from over-exertion or stress. Take daily as part of a nutritional program for anti-aging, sports recovery, pain, anxiety and stress management, support for heart/vascular health and proper immune system response. To learn more about each of the special ingredients, their actions and benefits in our Age-Less Anti-Inflammatory formula, see: Stress Is Killing Me! *Statements made on this site have not been evaluated by the FDA. These products are not intended to diagnose, treat, cure, or prevent any disease.